Whatever you do, give it your fullest attention. This is the only way to stop pursuing happiness and instead be happy. If you are brushing your teeth, make sure you are thinking about your teeth and be grateful for the millions of times they have helped you nurture and nourish yourself with good food. When you are looking out of your plane window, admire the sky, the clouds, the sun, the moon, the stars and be grateful for this opportunity to change the way you look at this world. Every time you text, WhatsApp or place a call, thank the people behind all the telecom revolutions we have witnessed: from Bell to Motorola, without whom we would not be connected in this big world. While on this Page, just admire the fact that facebook has made possible what you always sought in Life – great friendships! Giving attention is staying in the present. As Albert Einstein said, “Any man who can drive safely while kissing a pretty girl isn’t simply giving the kiss the attention it deserves”. 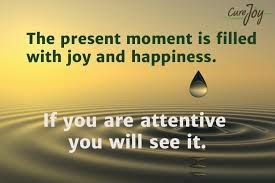 Give Life all your attention by living for and in the moment. Watch Life roll out a red carpet for you. It is in the present that there is happiness.